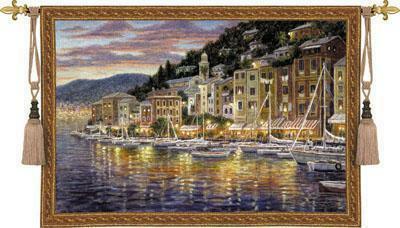 "Portofino Tapestry Wall Hanging" Sailboats line the dock of this Portofino bay while lights dance off the water from the cafe-lined street in this woven work of art. Woven on Jacquard looms. Cotton blend. Spot clean only. Rod pocket and weighted bottom included for easy hanging. Measures 52" wide x 35" long. Note: Rod and Tassels not included with item. May be purchased separately in my store.